A new study of climate models concludes that the record-breaking Australian summer of 201213 could not have happened without the human disturbancesgreenhouse gases, aerosols and ozonethat underlie global warming. The paper, accepted for publication by the journal Geophysical Research Letters or GRL, suggests that Australia's experience is a leading indicator for dry continental areas like our own American West. As a wine drinker, I think of the southern hemisphere as a leading hemisphere because the latest vintages come out of Australia six months before California's. Similarly, Australia is ahead of California in its vulnerability to global warming. Sustained high temperatures, not just record-setting heat for a day or so, have far-reaching effects: putting forests into extreme fire danger, punishing crops, raising the demand for water and electricity, changing storm tracks and rainfall and just getting on people's nerves. In that respect the period from December 2012 to February 2013 was truly "the Angry Summer," as documented in an official government report. 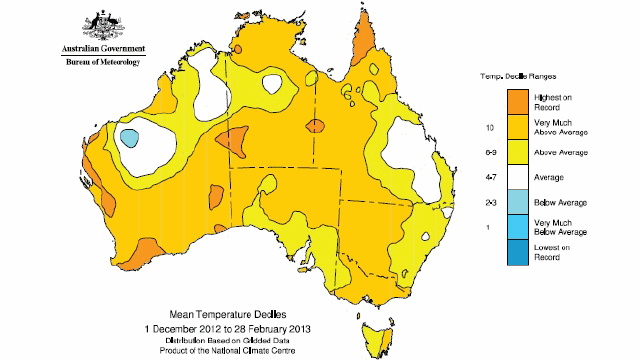 On January 7, the average high temperature for the whole country hit a record 40.30°C, or 104.5°F. That was in the middle of an entire week when this figure exceeded 39°C. Deadly bushfires erupted across Australia and burned for months, while deadly flooding occurred in the northern tropics where the hotter air carried more water vapor. Weather records stretching back to 1911 were broken in hundreds of places. Compared with the steady baseline of Australian climate from 1911 to 1940, the GRL authors said, the Angry Summer was 1.32°C warmer (2.4°F), on average for the whole country and season. From "Anthropogenic contributions to Australia's record summer temperatures of 2013"
The GRL paper tested the Angry Summer against a set of computer models from CMIP5, the latest generation of standardized climate models. These were first fed Australian climate data (monthly averages) from 1850 to 2005; nine models did well in reproducing the actual range of climatic conditions both with and without human influences. Then the models were used to see just how excessive the 201213 summer was. The authors' modeling showed, with 90 percent confidence, that human influence strongly increased the likelihood of that record-setting summer. Australian summers are strongly influenced by the El Niño cyclethe oscillation in the tropical Pacific that sends rain and heat to California as well as Australia and many points between. The GRL study stated that, in fact, El Niño was in a neutral state, which typically brings cool summers. That made the Angry Summer doubly unexpected. Without human influences, the authors concluded, the Angry Summer would be some five times less likely. Put another way, the atmosphere of today makes an Angry Summer, the worst on record, five times more likely than a century ago. Another study using CMIP5 models and the most current database on human emissions has stated that by 2080, within the lifetimes of today's children, such extreme summers may occur two years out of three. Keep that in mind as the American summer sets in. Another highlight of the study was the speed at which it was conducted, with high-quality models and data at the ready and a straightforward relationship established between observations and the risk of an abnormal season. The authors found that with their methods, "an assessment of risk could potentially occur in near-real time." The next Angry Summer, then, may not come as such a surprise.